Here's a recipe that I made up two years ago when Verne accidentally planted 29 zucchini plants. Brown sausage. Drain grease. Run cooked sausage through the food processor to crumble finely. Place in a bowl. Add eggs, cheddar cheese, and mustard. Mix well. Slice the zucchini, lengthwise. Scoop out the seeds with a spoon. 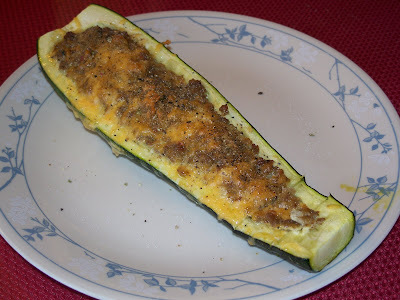 Spoon sausage mixture into the zucchini boats. Place the boats in a greased baking dish. Sprinkle with bread crumbs. Bake at 350 F for 40 minutes, until zucchini is tender. Sprinkle a little more cheese on top, and bake 5 minutes more.